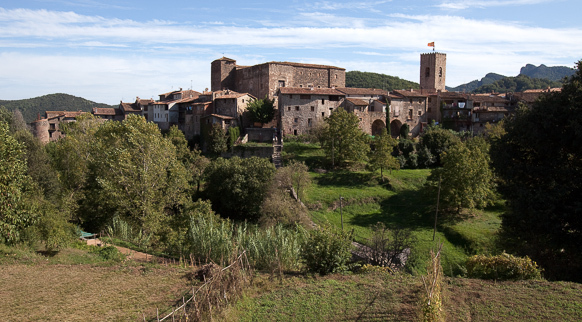 A town with real mediaeval charm, set in the heart of the Natural Park of the Garrotxa Volcanic Zone. Santa Pau could hardly sound more inviting. The vila vella (old town) of Santa Pau is centred around the castle (dating from between the 13th and 14th centuries, with a square floor plan) and around the main square, where the Gothic church of Santa Maria is located. Architectural beauty can also be appreciated along the narrow streets in the shade of the castle that lead you to the portal del mar (sea gate), from where you can enjoy the beauty of the landscape, with views of the valley of Santa Pau. It is also well worth continuing a little further afield and visiting the nearby valleys, in particular the area of the sanctuaries of Mare de Déu dels Arcs and Santa Margarida de la Cot, which offer wonderful sweeping views that take in some of area's volcanoes.